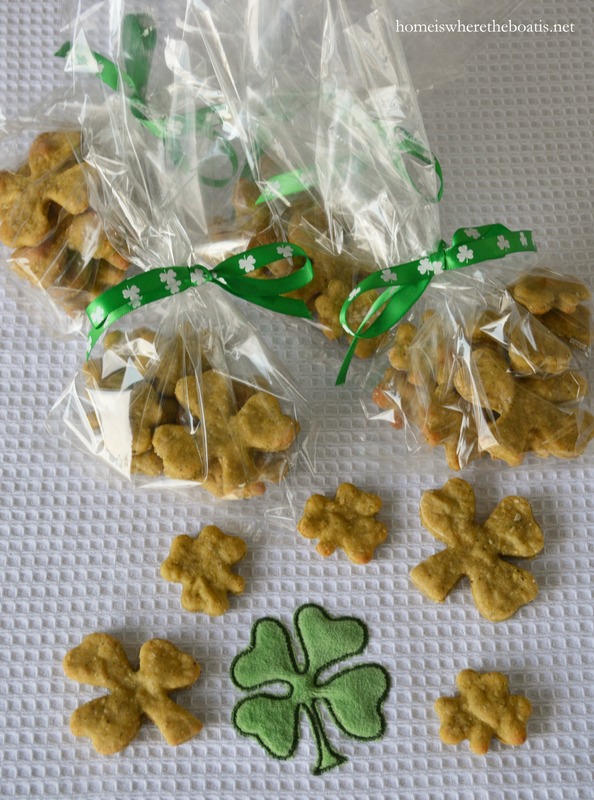 for Lucky Dogs for St. Patrick’s Day! 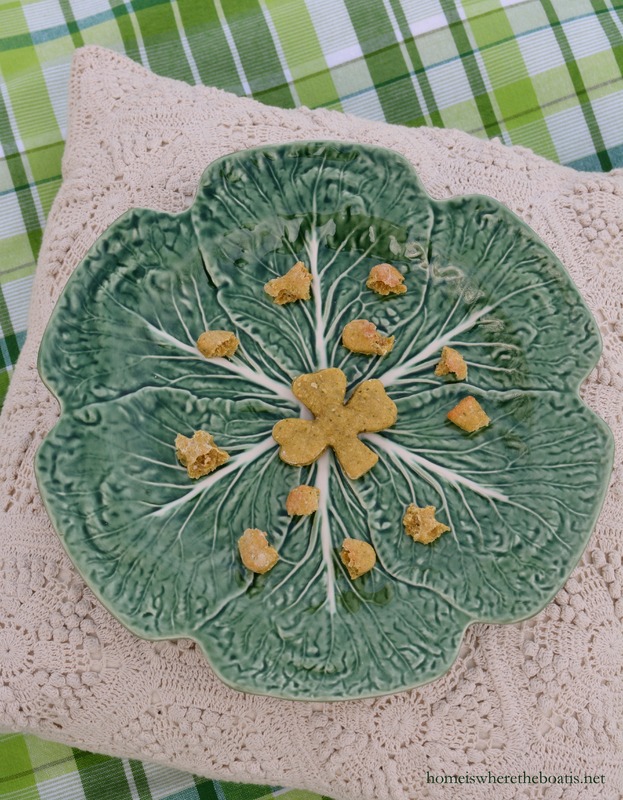 These treats are full of good and healthy ingredients . . .applesauce, peanut butter, oats, whole wheat flour and spinach. Spinach is full of vitamins and safe for dogs, but the leaves do contain oxalates. In large amounts, oxalates can cause kidney problems but the amount a dog would have to eat is so high it’s unlikely. If you’re concerned about feeding your dog spinach, omit it. 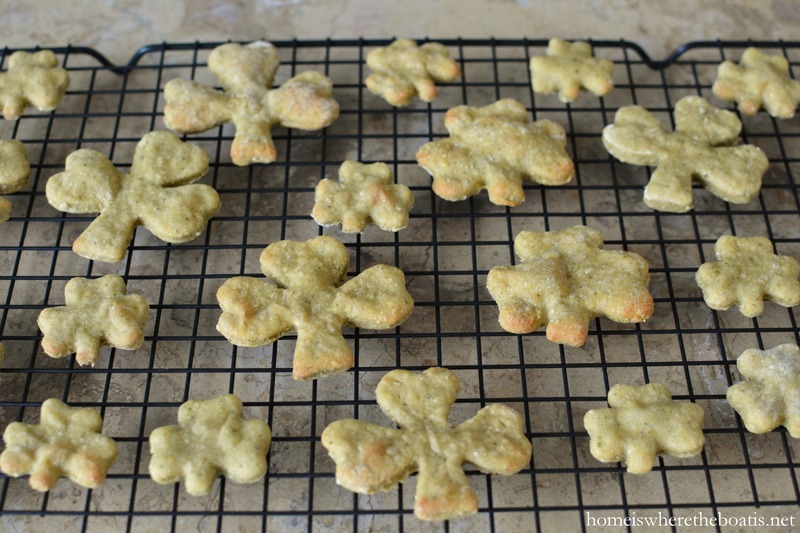 These shamrock treats smell great cooking with the peanut butter and kids would have fun cutting out a variety of shapes for their canine friends or lucky dogs! 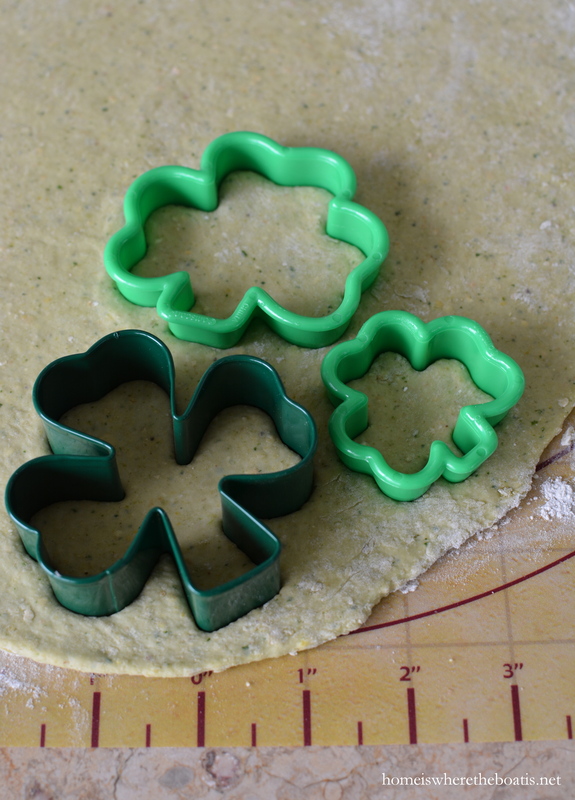 Makes approximately 2 – 3 dozen treats depending on size of cookie cutter. They freeze well too. I made these treats in a food processor for easy mixing and one bowl clean up since I was using it to chop the spinach leaves. If you don’t have or want to use a food processor, chop spinach leaves fine and add them to a medium bowl with your wet ingredients. Mix dry ingredients together, then add them gradually to your wet ingredients. In food processor, add spinach leaves, pulse until chopped. Add egg, peanut butter, applesauce, and water to food processor and pulse to combine. Add dry ingredients and process until dough comes together. Turn dough out onto a floured surface and knead, forming into a ball. Add additional flour as needed if dough is too sticky and roll out to 1/4 inch thick and cut into shapes. Reroll scraps and repeat. 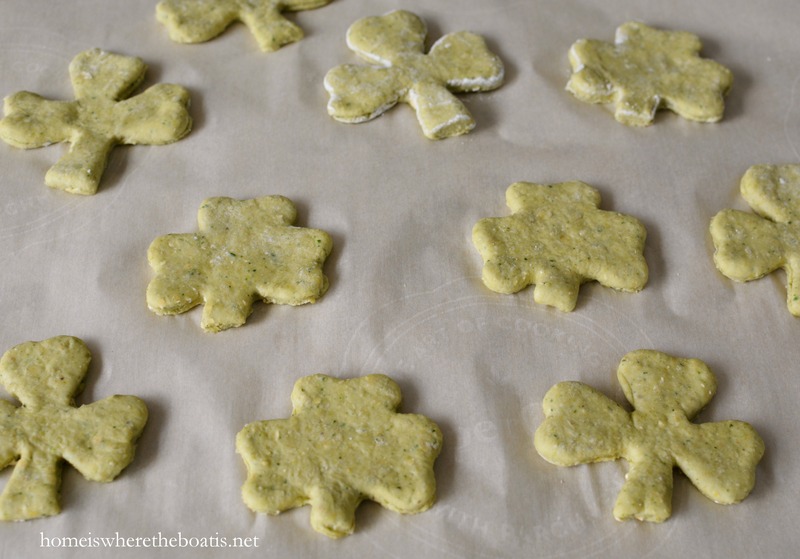 Place shamrocks on parchment or greased cookie sheet and bake 15 minutes – 25 minutes, according to the size of your treats and your oven. Watch and remove when slightly browned. Cool on a rack and store in sealed container. 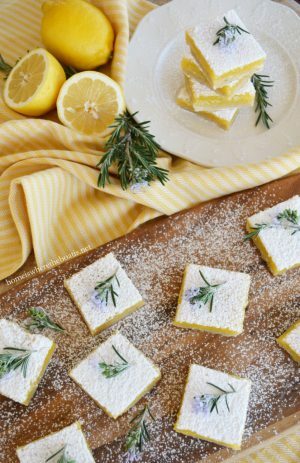 You can find a printable recipe, here. We bagged some treats up to share with other lucky dogs. . .
And our favorite Irish girl and beach dog, Presley, a Soft-coated Wheaten Terrier. 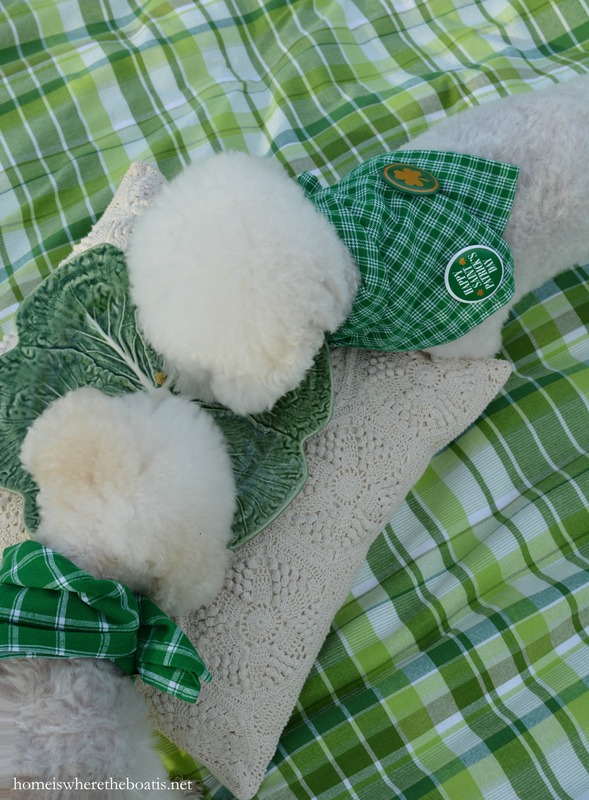 Chloe & Gracie are wearing their green for St. Paddy’s Day! 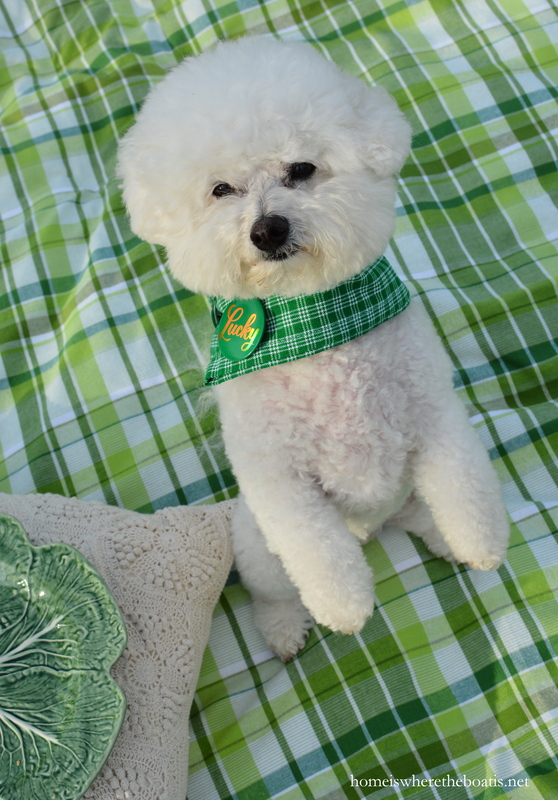 I was going to buy some green fabric to cut for bandanas, but saved myself a trip to the fabric store and used green dish towels I had instead, folded and tied for a neckerchief to slip over their heads. St. Patrick’s Day buttons were in the dollar bin at Target, in a package of 6 for $3. 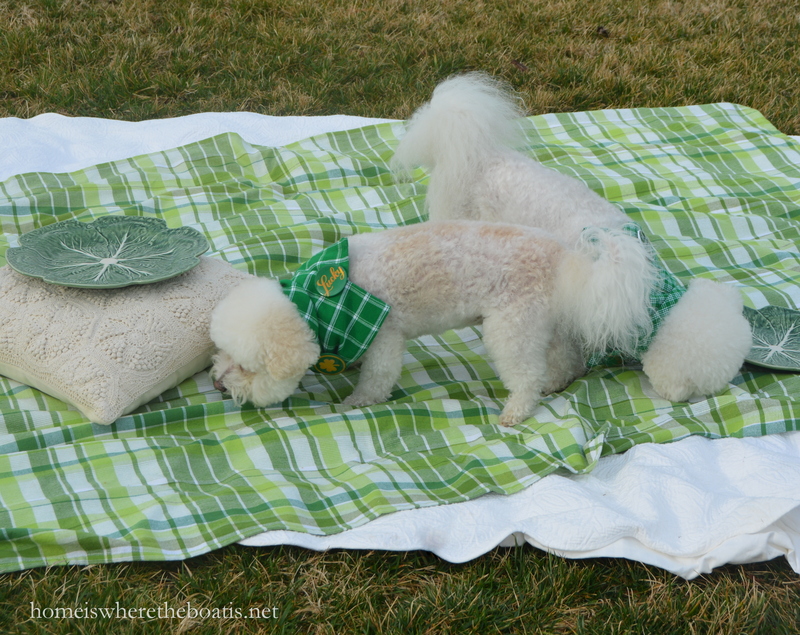 Happy St. Patrick’s from Two Lucky Dogs! Oh Mary! I just LOVE this post!! Chloe and Gracie are SO adorable!! Give them hugs from me and the girls!! Happy St. Patrick’s Day to you all! Fiona, (my Wheatie), and I LOVE this post! Happy St. Pat’s Day to you and your girls, and Presley, too!!!! It always makes me start my day with a smile when I see pictures of Chole and Grace. Top O’ the morning to you all! Gracie & Chole make me miss my little Tootsie. She’s been gone a couple years now but not forgotten. So happy to know that other people take good care of their dogs like we did. They are certainly 2 lucky dogs and so very cute. The Wheaton too! HAPPY ST. PATRICK’S DAY CHOLE & GRACIE! What lucky little doggies you have! 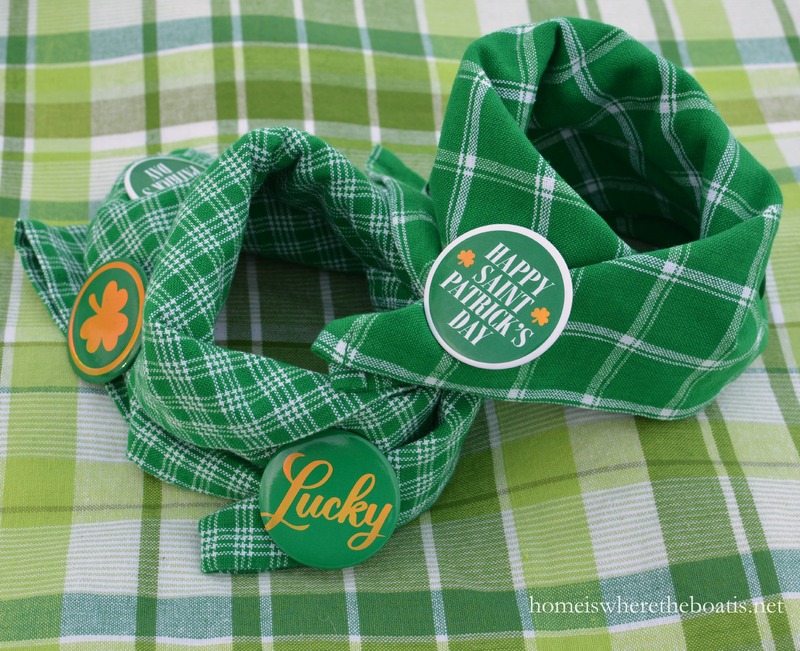 Love their neckerchiefs…so..St. Pattys day attire! Mary, I made your Irish Stew, and it was wonderful! There was a lot of peeling and chopping, but it was well worth it! Thanks! Awwww….top ‘o the mornin’ to you and Chloe and Gracie, Mary! 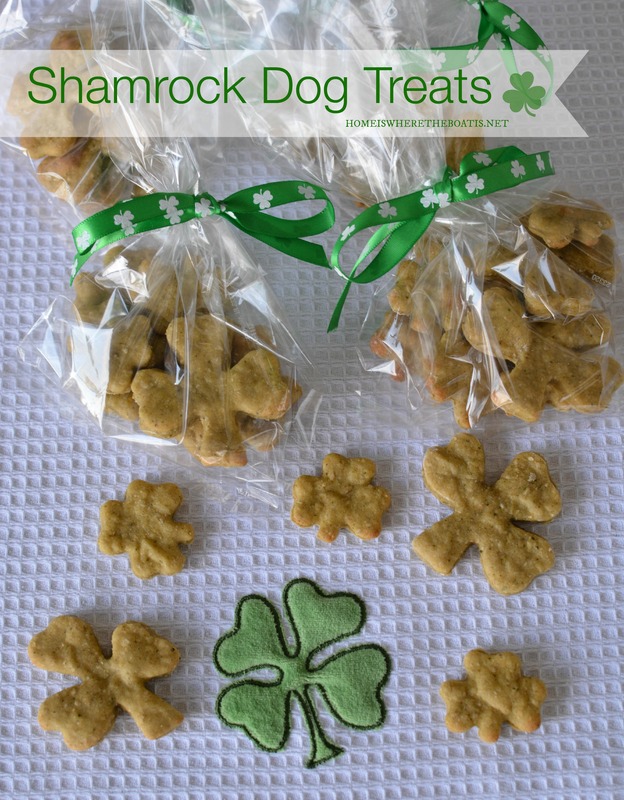 What wondefully healthy treats you’ve prepared for your lucky pups! Happy St. Paddy’s Day!! Treats look wonderful and your two cuties look like they really enjoy them. I won’t be able to make them for my Red Labador because he is allergic to egg and wheat among a dozen other things. 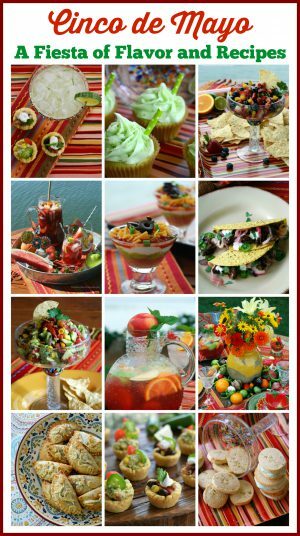 Thanks for all the beautiful pictures and hard work you do for your very enjoyable posts. Hahaha! !! Those lucky dogs!! So adorable! HAPPY St. Patrick’s Day! What precious pups! I wonder if they know how lucky they are to have you as their Mom!! 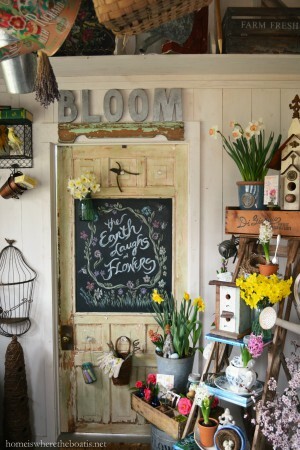 I am a dog worshipper and today’s blog is delightful! I really look forward to opening your blog as it’s always beautiful and inspiring! Hi Auntie Mary!! Can’t wait to get my paws on those treats!! Thanks for thinking of me on my favorite holiday!! Love you! PS: Mom says thanks too!! You two little girls are absolutely the cutest! Hugs from a Bichon lover. Love this post and your babies. That is one beautiful crocheted pillow…did you crochet it? 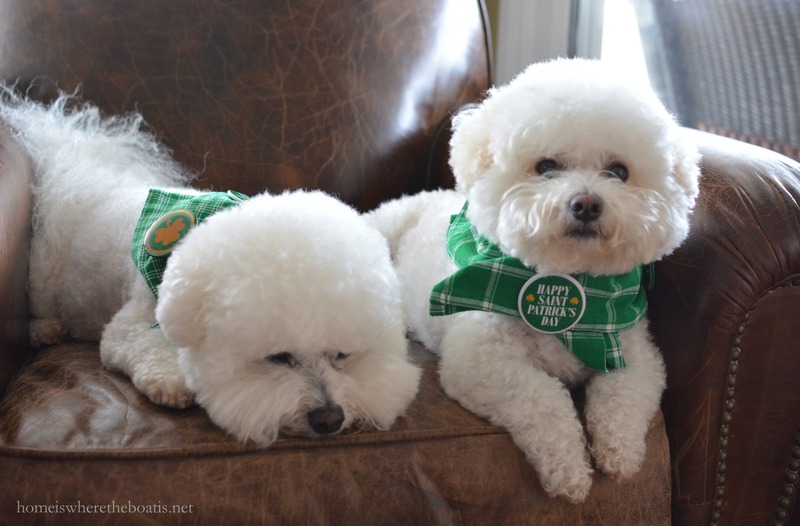 Chloe and Gracie are so precious in their St. Patrick’s Day scarves. We put a green scarf on our Shortie. No doggie treats for her as she is on a special diet since she is overweight but still active as well as lovable. Happy St. Patrick’s Day!! Those two are just too cute. Just want to cuddle and hug them. Love your posts that include the girls. Happy St. Patty’s Day to all! Darling baby dogs! Pinning your recipe to my doggie board. I think Psychodog would love these, she adores peanut butter. The treats look yummy. I’ll try my hand at making some for our girl. Peanut butter treats are her favorite. Such lucky girls indeed! 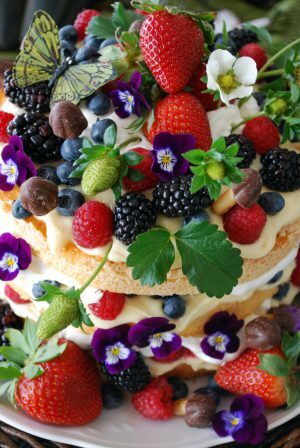 Whenever you bake for your girls I feel so guilty I barely bake for my husband…. if they weren’t so cute I would feel ashamed for my bad behavior, but with all that joy I get it! 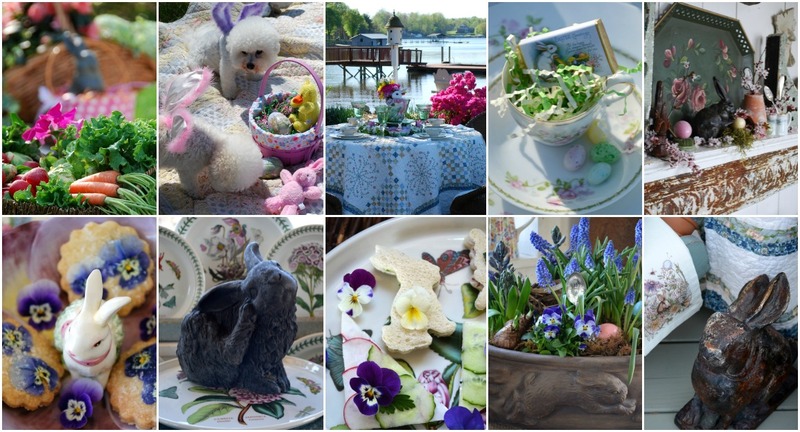 Your furry and feathered friends sure live the high life at your house Mary, with all the homemade treats! 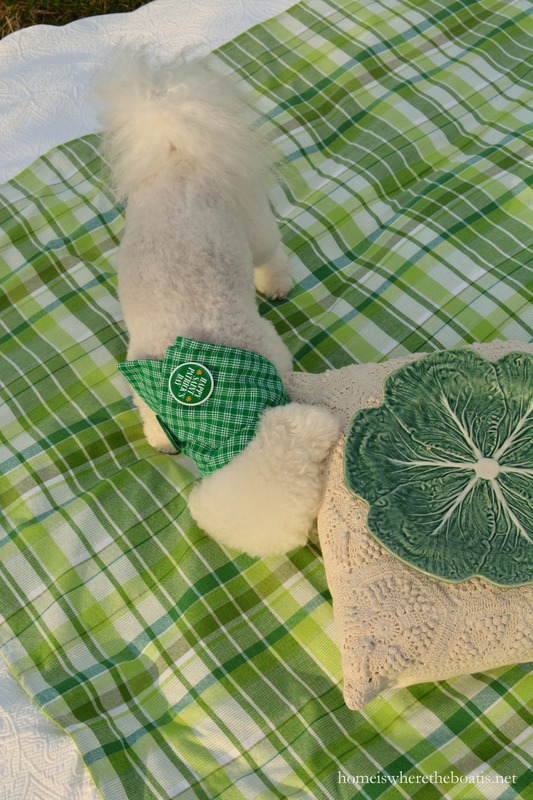 I’m sure it’s worth the little extra effort knowing their treats are full of good nutrition~I love their clever neckerchiefs and the lucky treats served on a cabbage plate…I bet the girls will be adorable Easter bunnies too! My Buddy (English Cocker /Black Lab / Retriever mix) loves peanut butter too! Will have to try these. Thanks Mary!